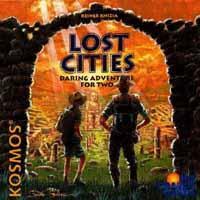 Lost Cities , Reiner Knizia, Kosmos/Rio Grande Games, 1999. Lost Cities is an enjoyable card game for those who like to play two player card games with a spouse or friend. Gin Rummy and two-player Hearts are vaguely similar games that come to mind, but Lost Cities provides the added benefit of an extra suit and beautiful card artwork for those who are tired of looking at the same old clubs, diamonds, hearts, and spades. The game is played with a card deck of five suits each depicting an expedition to a lost city: red shows a volcanic land, green shows a jungle ruin, yellow shows a desert excavation, white shows a mountainous temple, and blue shows an underwater city. In the game the words suit and expedition are synonymous. Within a suit there are nine cards numbered 2 through 10 and three investment cards represented by a handshake icon. The card artwork is gloriously illustrated by Grafik Studio Krüger's Claus Stephan with graphic work by Anke Pohl and Thilo Rick. Each of the numbered cards shows a segment of an expedition. As you view the cards in ascending order, the subjective view pans and zooms through the scene until card 10 shows the final goal of the expedition -- quite imaginative! The basic play mechanism is to play a card and draw another to keep 8 cards in hand. When played, cards must always be played into a pile matching its suit. Cards may be played in front of you to form an expedition, or in a common discard pile between the two players. For untidy players, a superfluous tri-fold board marks the spots to place the discards - a prime example of providing filler not necessary for the game. The expedition piles must be played in growing sequential order. Investment cards must be played at the beginning of an expedition pile, or else they must be discarded. To end your move, a card may be drawn from the hidden draw pile or from an exposed discard pile. The round ends when the draw pile is empty, and the game consists of three rounds. The goal of the game is to outscore your opponent through the game's scoring system. The scoring system is extremely well constructed and makes up the bulk of the creativity in the game design. Each of your expedition piles scores the sum of the numeric cards therein. However, expeditions have a fixed cost of 20 points which must be deducted from the total. So, at the end of round, an expedition pile of cards 3, 5, 8, 10 scores 6 points (3+5+8+10=26, 26-20=6). The investment cards played at the beginning of an expedition pile double, treble, and quadruple the score. Ironically, this multiplier can be good or bad depending on whether the expedition reaches the magic number 20. For instance an expedition pile of I, I, 3, 4, 9 will cost the player 12 points (3+4+9=16, 16-20=-4, -4*3=-12). Additionally, a whopping 20 point bonus is given to any expedition pile of 8 or more cards. Lady Luck makes this one difficult to achieve. The scoring may seem a bit dry and mathematical, but the game moves very quickly. Most of the fun comes from seeing your opponent reveal their plays and trying to thwart or slow their progress. For instance, opening an expedition provides your opponent with crucial information about which suit you are developing. The standard counter to this play is for the opponent to hoard cards of that suit. However, each blocking card held in your hand lessens the number of point producing plays one can make in a turn. Experienced players often develop expeditions in their hidden hand, and wait as long as possible before laying information upon the table. One thing is certain: the round ends very quickly and both players are forced to junk their last 8 cards. This game truly is a race to score many points as quickly as possible. If possible, always try to play a card to one of your expeditions because it will gain you some points. Discards should be avoided if at all possible -- discards add nothing to the final point total. If no expedition is available, consider opening a new one. But beware, each expedition you reveal is information for your opponent, and once exposed, you must race to get to 20 points before your opponent thwarts you. My biggest fault in playing this game is being too conservative. I find that I lose by carefully planning and playing 3 good expeditions, but getting outscored by my opponent who wildly develops 4 expeditions. The lesson learned is that one should not waste time trying to fill in every hole in the sequence or playing too many low value cards -- smash that 20 point magic number and move on. You have more play options with 4 leaky expeditions than with 3 orderly expeditions. discard a card in an expedition when there are not enough plays left to develop the expedition (the game-is-ending discard). Discards and some psychology can be used to figure out which cards your opponent really needs. Of course, being a card game, there will be some rounds where you draw the cards you need and some where you don't. Luck can imbalance the game by providing one player with all the 9's and 10's and providing the other with all the low cards. Usually the 3 rounds in a game should even out the luck factor. If not, watch carefully how your opponent shuffles and deals the cards. For those interested in the translation to English, there are no words or letters on the cards, simply Arabic numerals and symbols. Jay Tummelson translated the text, and the box and the rulebook are rendered in glorious, full-color text and artwork. Another excellent English translation for Rio Grande Games! All in all, I say this is a very fun light card game. It is easy to play 3 or 6 rounds in between other longer game or while watching a basketball game. The card deck is compact and can be removed and taken on a car trip or camping outing -- just leave the board and the box at home if space is an issue. If you would like to demo this game before you buy, you can easily manufacture it from two decks of standard cards: omit the aces, use face cards for investments, and mark one suit to be the fifth suit, for instance color in the hearts to make a black hearts suit. In a few games you can see if it is worth for you to spring the $19.95 list (or $13.95 retail) price for this game. I think it is. [an error occurred while processing this directive] Last modified: Thursday, 09-Jun-2011 12:36:50 MST.